And the month of February has dawned. Yet I do not suppose that all would oppose. From enjoying its good years cheer. I got a ride to school this morning, though the walking was perfectly fine! I got some candy of Jimmie’s tonight (he had quite a bit too much for a boy of his size so I relieved him of some). 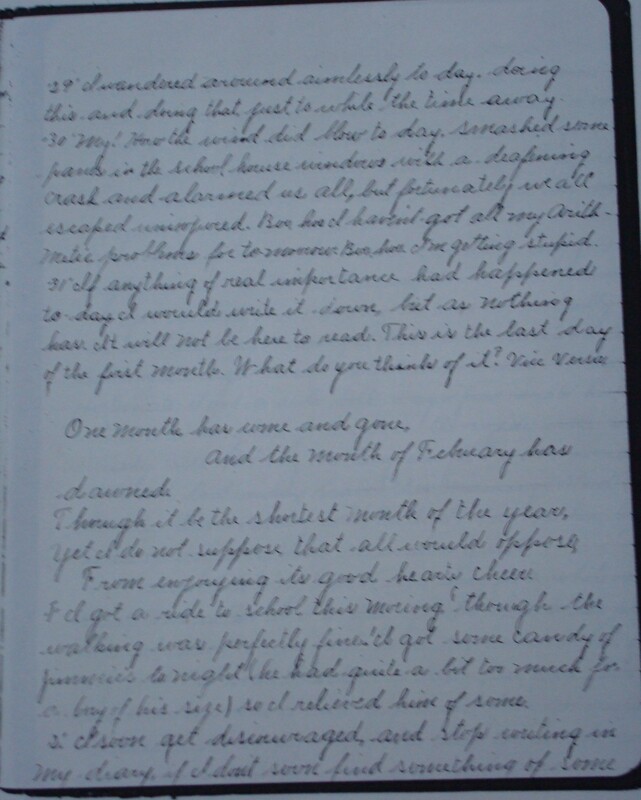 The diary was written in a blank lined paper book. Each month of the diary begins with a poem. I wonder if Grandma wrote the poems or if she got them out of a book or magazine. A hundred years ago poetry was much more popular than it is now. Magazines such as Ladies Home Journal included entire pages of poetry. Students were regularly required to memorize poems and teachers had poetry books that they used as sources for these poems. Pamphlets were printed by various religious denominations that contained poems which Sunday School children could memorize and then present. This month’s poem doesn’t really work for me—and maybe Grandma wrote it—though I’m guessing that she got these monthly poems from other some source. I’ll probably never know for sure. This is the first time that Jimmie is mentioned in the diary. He was Grandma’s six-year-old brother.